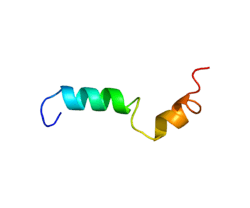 The cannabinoid receptor type 2, abbreviated as CB2, is a G protein-coupled receptor from the cannabinoid receptor family that in humans is encoded by the CNR2 gene. It is closely related to the cannabinoid receptor type 1, which is largely responsible for the efficacy of endocannabinoid-mediated presynaptic-inhibition, the psychoactive properties of tetrahydrocannabinol, the active agent in cannabis, and other phytocannabinoids (natural cannabinoids). The principal endogenous ligand for the CB2 receptor is 2-arachidonoylglycerol (2-AG). CB2 receptors may have possible therapeutic roles in the treatment of neurodegenerative disorders such as Alzheimer's disease. Specifically, the CB2 agonist JWH-015 was shown to induce macrophages to remove native beta-amyloid protein from frozen human tissues. In patient's with Alzheimer's disease, beta-amyloid proteins form aggregates known as senile plaques, which disrupt neural functioning. ↑ "Drugs that physically interact with Cannabinoid receptor 2 view/edit references on wikidata". 1 2 3 4 5 Munro S, Thomas KL, Abu-Shaar M (Sep 1993). "Molecular characterization of a peripheral receptor for cannabinoids". Nature. 365 (6441): 61–5. doi:10.1038/365061a0. PMID 7689702. 1 2 3 4 5 Basu S, Ray A, Dittel BN (Dec 2011). "Cannabinoid receptor 2 is critical for the homing and retention of marginal zone B lineage cells and for efficient T-independent immune responses". Journal of Immunology. 187 (11): 5720–32. doi:10.4049/jimmunol.1102195. PMC 3226756 . PMID 22048769. ↑ "Entrez Gene: CNR2 cannabinoid receptor 2 (macrophage)". 1 2 Elphick MR, Egertová M (Mar 2001). "The neurobiology and evolution of cannabinoid signalling". Philosophical Transactions of the Royal Society of London. Series B, Biological Sciences. 356 (1407): 381–408. doi:10.1098/rstb.2000.0787. PMC 1088434 . PMID 11316486. 1 2 3 4 5 Cabral GA, Griffin-Thomas L (2009). "Emerging role of the cannabinoid receptor CB2 in immune regulation: therapeutic prospects for neuroinflammation". Expert Reviews in Molecular Medicine. 11: e3. doi:10.1017/S1462399409000957. PMC 2768535 . PMID 19152719. 1 2 3 4 5 Galiègue S, Mary S, Marchand J, Dussossoy D, Carrière D, Carayon P, Bouaboula M, Shire D, Le Fur G, Casellas P (Aug 1995). "Expression of central and peripheral cannabinoid receptors in human immune tissues and leukocyte subpopulations". European Journal of Biochemistry / FEBS. 232 (1): 54–61. doi:10.1111/j.1432-1033.1995.tb20780.x. PMID 7556170. ↑ Griffin G, Tao Q, Abood ME (Mar 2000). "Cloning and pharmacological characterization of the rat CB(2) cannabinoid receptor". The Journal of Pharmacology and Experimental Therapeutics. 292 (3): 886–94. PMID 10688601. 1 2 3 Tuccinardi T, Ferrarini PL, Manera C, Ortore G, Saccomanni G, Martinelli A (Feb 2006). "Cannabinoid CB2/CB1 selectivity. Receptor modeling and automated docking analysis". Journal of Medicinal Chemistry. 49 (3): 984–94. doi:10.1021/jm050875u. PMID 16451064. 1 2 3 4 5 Shoemaker JL, Ruckle MB, Mayeux PR, Prather PL (Nov 2005). "Agonist-directed trafficking of response by endocannabinoids acting at CB2 receptors". The Journal of Pharmacology and Experimental Therapeutics. 315 (2): 828–38. doi:10.1124/jpet.105.089474. PMID 16081674. 1 2 Demuth DG, Molleman A (Jan 2006). "Cannabinoid signalling". Life Sciences. 78 (6): 549–63. doi:10.1016/j.lfs.2005.05.055. PMID 16109430. 1 2 Bouaboula M, Poinot-Chazel C, Marchand J, Canat X, Bourrié B, Rinaldi-Carmona M, Calandra B, Le Fur G, Casellas P (May 1996). "Signaling pathway associated with stimulation of CB2 peripheral cannabinoid receptor. Involvement of both mitogen-activated protein kinase and induction of Krox-24 expression". European Journal of Biochemistry / FEBS. 237 (3): 704–11. doi:10.1111/j.1432-1033.1996.0704p.x. PMID 8647116. ↑ Shvartsman SY, Coppey M, Berezhkovskii AM (2009). "MAPK signaling in equations and embryos". Fly. 3 (1): 62–7. doi:10.4161/fly.3.1.7776. PMC 2712890 . PMID 19182542. ↑ Klemke RL, Cai S, Giannini AL, Gallagher PJ, de Lanerolle P, Cheresh DA (Apr 1997). "Regulation of cell motility by mitogen-activated protein kinase". The Journal of Cell Biology. 137 (2): 481–92. doi:10.1083/jcb.137.2.481. PMC 2139771 . PMID 9128257. ↑ Alberini CM (Jan 2009). "Transcription factors in long-term memory and synaptic plasticity". Physiological Reviews. 89 (1): 121–45. doi:10.1152/physrev.00017.2008. PMID 19126756. ↑ Bisogno T, Melck D, Gretskaya NM, Bezuglov VV, De Petrocellis L, Di Marzo V (Nov 2000). "N-acyl-dopamines: novel synthetic CB(1) cannabinoid-receptor ligands and inhibitors of anandamide inactivation with cannabimimetic activity in vitro and in vivo". The Biochemical Journal. 351 (3): 817–24. doi:10.1042/bj3510817. PMC 1221424 . PMID 11042139. ↑ Rogers, Nala. "Cannabinoid receptor with an 'identity crisis' gets a second look". Nature Medicine. 21 (9): 966–967. doi:10.1038/nm0915-966. 1 2 Pertwee RG (Apr 2006). "The pharmacology of cannabinoid receptors and their ligands: an overview". International Journal of Obesity. 30 Suppl 1: S13–8. doi:10.1038/sj.ijo.0803272. PMID 16570099. ↑ Miller AM, Stella N (Jan 2008). "CB2 receptor-mediated migration of immune cells: it can go either way". British Journal of Pharmacology. 153 (2): 299–308. doi:10.1038/sj.bjp.0707523. PMC 2219538 . PMID 17982478. ↑ Ashton JC, Glass M (June 2007). "The cannabinoid CB2 receptor as a target for inflammation-dependent neurodegeneration". Current Neuropharmacology. 5 (2): 73–80. doi:10.2174/157015907780866884. PMC 2435344 . PMID 18615177. ↑ Centonze D, Battistini L, Maccarrone M (2008). "The endocannabinoid system in peripheral lymphocytes as a mirror of neuroinflammatory diseases". Current Pharmaceutical Design. 14 (23): 2370–42. doi:10.2174/138161208785740018. PMID 18781987. ↑ Onaivi ES (2006). "Neuropsychobiological evidence for the functional presence and expression of cannabinoid CB2 receptors in the brain". Neuropsychobiology. 54 (4): 231–46. doi:10.1159/000100778. PMID 17356307. ↑ Cabral GA, Raborn ES, Griffin L, Dennis J, Marciano-Cabral F (Jan 2008). "CB2 receptors in the brain: role in central immune function". British Journal of Pharmacology. 153 (2): 240–51. doi:10.1038/sj.bjp.0707584. PMC 2219530 . PMID 18037916. ↑ Sickle, Marja D. Van; Duncan, Marnie; Kingsley, Philip J.; Mouihate, Abdeslam; Urbani, Paolo; Mackie, Ken; Stella, Nephi; Makriyannis, Alexandros; Piomelli, Daniele (2005-10-14). "Identification and Functional Characterization of Brainstem Cannabinoid CB2 Receptors". Science. 310 (5746): 329–332. doi:10.1126/science.1115740. ISSN 0036-8075. PMID 16224028. ↑ Gong, Jian-Ping; Onaivi, Emmanuel S.; Ishiguro, Hiroki; Liu, Qing-Rong; Tagliaferro, Patricia A.; Brusco, Alicia; Uhl, George R. (2006-02-03). "Cannabinoid CB2 receptors: Immunohistochemical localization in rat brain". Brain Research. 1071 (1): 10–23. doi:10.1016/j.brainres.2005.11.035. ↑ López EM, Tagliaferro P, Onaivi ES, López-Costa JJ (May 2011). "Distribution of CB2 cannabinoid receptor in adult rat retina". Synapse. 65 (5): 388–92. doi:10.1002/syn.20856. PMID 20803619. ↑ Zhang HY, Gao M, Shen H, Bi GH, Yang HJ, Liu QR, Wu J, Gardner EL, Bonci A, Xi ZX (2016). "Expression of functional cannabinoid CB2 receptor in VTA dopamine neurons in rats". Addiction Biology. doi:10.1111/adb.12367. PMID 26833913. ↑ Stempel AV, Stumpf A, Zhang HY, Özdoğan T, Pannasch U, Theis AK, Otte DM, Wojtalla A, Rácz I, Ponomarenko A, Xi ZX, Zimmer A, Schmitz D (2016). "Cannabinoid Type 2 Receptors Mediate a Cell Type-Specific Plasticity in the Hippocampus". Neuron. 90 (4): 795–809. doi:10.1016/j.neuron.2016.03.034. PMID 27133464. ↑ Izzo AA (Aug 2004). "Cannabinoids and intestinal motility: welcome to CB2 receptors". British Journal of Pharmacology. 142 (8): 1201–2. doi:10.1038/sj.bjp.0705890. PMC 1575197 . PMID 15277313. 1 2 Wright KL, Duncan M, Sharkey KA (Jan 2008). "Cannabinoid CB2 receptors in the gastrointestinal tract: a regulatory system in states of inflammation". British Journal of Pharmacology. 153 (2): 263–70. doi:10.1038/sj.bjp.0707486. PMC 2219529 . PMID 17906675. ↑ Capasso R, Borrelli F, Aviello G, Romano B, Scalisi C, Capasso F, Izzo AA (Jul 2008). "Cannabidiol, extracted from Cannabis sativa, selectively inhibits inflammatory hypermotility in mice". British Journal of Pharmacology. 154 (5): 1001–8. doi:10.1038/bjp.2008.177. PMC 2451037 . PMID 18469842. ↑ Storr MA, Yüce B, Andrews CN, Sharkey KA (Aug 2008). "The role of the endocannabinoid system in the pathophysiology and treatment of irritable bowel syndrome". Neurogastroenterology and Motility. 20 (8): 857–68. doi:10.1111/j.1365-2982.2008.01175.x. PMID 18710476. ↑ Wong BS, Camilleri M, Busciglio I, Carlson P, Szarka LA, Burton D, Zinsmeister AR (Nov 2011). "Pharmacogenetic trial of a cannabinoid agonist shows reduced fasting colonic motility in patients with nonconstipated irritable bowel syndrome". Gastroenterology. 141 (5): 1638–47.e1–7. doi:10.1053/j.gastro.2011.07.036. PMID 21803011. 1 2 Kaminski NE (Dec 1998). "Inhibition of the cAMP signaling cascade via cannabinoid receptors: a putative mechanism of immune modulation by cannabinoid compounds". Toxicology Letters. 102-103: 59–63. doi:10.1016/S0378-4274(98)00284-7. PMID 10022233. 1 2 Herring AC, Koh WS, Kaminski NE (Apr 1998). "Inhibition of the cyclic AMP signaling cascade and nuclear factor binding to CRE and kappaB elements by cannabinol, a minimally CNS-active cannabinoid". Biochemical Pharmacology. 55 (7): 1013–23. doi:10.1016/S0006-2952(97)00630-8. PMID 9605425. 1 2 Kaminski NE (Oct 1996). "Immune regulation by cannabinoid compounds through the inhibition of the cyclic AMP signaling cascade and altered gene expression". Biochemical Pharmacology. 52 (8): 1133–40. doi:10.1016/0006-2952(96)00480-7. PMID 8937419. ↑ Cheng Y, Hitchcock SA (Jul 2007). "Targeting cannabinoid agonists for inflammatory and neuropathic pain". Expert Opinion on Investigational Drugs. 16 (7): 951–65. doi:10.1517/13543784.16.7.951. PMID 17594182. ↑ Pertwee RG (Jan 2008). "The diverse CB1 and CB2 receptor pharmacology of three plant cannabinoids: delta9-tetrahydrocannabinol, cannabidiol and delta9-tetrahydrocannabivarin". British Journal of Pharmacology. 153 (2): 199–215. doi:10.1038/sj.bjp.0707442. PMC 2219532 . PMID 17828291. ↑ Benito C, Núñez E, Tolón RM, Carrier EJ, Rábano A, Hillard CJ, Romero J (Dec 2003). "Cannabinoid CB2 receptors and fatty acid amide hydrolase are selectively overexpressed in neuritic plaque-associated glia in Alzheimer's disease brains". The Journal of Neuroscience. 23 (35): 11136–41. PMID 14657172. ↑ Fernández-Ruiz J, Pazos MR, García-Arencibia M, Sagredo O, Ramos JA (Apr 2008). "Role of CB2 receptors in neuroprotective effects of cannabinoids". Molecular and Cellular Endocrinology. 286 (1-2 Suppl 1): S91–6. doi:10.1016/j.mce.2008.01.001. PMID 18291574. ↑ Tolón RM, Núñez E, Pazos MR, Benito C, Castillo AI, Martínez-Orgado JA, Romero J (Aug 2009). "The activation of cannabinoid CB2 receptors stimulates in situ and in vitro beta-amyloid removal by human macrophages". Brain Research. 1283 (11): 148–54. doi:10.1016/j.brainres.2009.05.098. PMID 19505450. ↑ Tiraboschi P, Hansen LA, Thal LJ, Corey-Bloom J (Jun 2004). "The importance of neuritic plaques and tangles to the development and evolution of AD". Neurology. 62 (11): 1984–9. doi:10.1212/01.WNL.0000129697.01779.0A. PMID 15184601. 1 2 Pacher P, Mechoulam R (Apr 2011). "Is lipid signaling through cannabinoid 2 receptors part of a protective system?". Progress in Lipid Research. 50 (2): 193–211. doi:10.1016/j.plipres.2011.01.001. PMC 3062638 . PMID 21295074. ↑ Marriott KS, Huffman JW (2008). "Recent advances in the development of selective ligands for the cannabinoid CB(2) receptor". Current Topics in Medicinal Chemistry. 8 (3): 187–204. doi:10.2174/156802608783498014. PMID 18289088. 1 2 3 Korte G, Dreiseitel A, Schreier P, Oehme A, Locher S, Geiger S, Heilmann J, Sand PG (Jan 2010). "Tea catechins' affinity for human cannabinoid receptors". Phytomedicine. 17 (1): 19–22. doi:10.1016/j.phymed.2009.10.001. PMID 19897346. 1 2 3 4 5 6 Gertsch J, Pertwee RG, Di Marzo V (Jun 2010). "Phytocannabinoids beyond the Cannabis plant - do they exist?". British Journal of Pharmacology. 160 (3): 523–9. doi:10.1111/j.1476-5381.2010.00745.x. PMC 2931553 . PMID 20590562. 1 2 3 Aung MM, Griffin G, Huffman JW, Wu M, Keel C, Yang B, Showalter VM, Abood ME, Martin BR (Aug 2000). "Influence of the N-1 alkyl chain length of cannabimimetic indoles upon CB(1) and CB(2) receptor binding". Drug and Alcohol Dependence. 60 (2): 133–40. doi:10.1016/S0376-8716(99)00152-0. PMID 10940540. Casanova ML, Blázquez C, Martínez-Palacio J, Villanueva C, Fernández-Aceñero MJ, Huffman JW, Jorcano JL, Guzmán M (Jan 2003). "Inhibition of skin tumor growth and angiogenesis in vivo by activation of cannabinoid receptors". The Journal of Clinical Investigation. 111 (1): 43–50. doi:10.1172/JCI16116. PMC 151833 . PMID 12511587. Gokoh M, Kishimoto S, Oka S, Mori M, Waku K, Ishima Y, Sugiura T (Mar 2005). "2-arachidonoylglycerol, an endogenous cannabinoid receptor ligand, induces rapid actin polymerization in HL-60 cells differentiated into macrophage-like cells". The Biochemical Journal. 386 (Pt 3): 583–9. doi:10.1042/BJ20041163. PMC 1134878 . PMID 15456404. Miller, A. M.; Stella, N. (2008). "CB2receptor-mediated migration of immune cells: it can go either way". British Journal of Pharmacology. 153 (2): 299–308. doi:10.1038/sj.bjp.0707523. PMC 2219538 . PMID 17982478.